These plastic snap rings are ideal fasteners for swatch books, brochures, and light-weight signs. The unique fastening design makes for a smooth, finished look once the rings are closed. Our 11/16 inch inside diameter black Plastic Snap Rings have an a easy to use one piece snap closure design. Simply press closed for hanging of signs from wire fixtures or to make light weight sample swatches. Sold in packages of 100. Our 11/16 inch inside diameter White Plastic Snap Rings have an a easy to use one piece snap closure design. Simply press closed for hanging of signs from wire fixtures or to make light weight sample swatches. Sold in packages of 100. 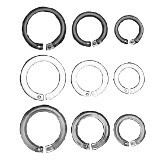 Our 11/16 inch inside diameter clear Plastic Snap Rings have an a easy to use one piece snap closure design. Simply press closed for hanging of signs from wire fixtures or to make light weight sample swatches. Sold in packages of 100. Our 7/8 inch inside diameter black Plastic Snap Rings have an a easy to use one piece snap closure design. Simply press closed for hanging of signs from wire fixtures or to make light weight sample swatches. Sold in packages of 100. Our 7/8 inch inside diameter white Plastic Snap Rings have an a easy to use one piece snap closure design. Simply press closed for hanging of signs from wire fixtures or to make light weight sample swatches. Sold in packages of 100. Our 7/8 inch inside diameter Clear Plastic Snap Rings have an a easy to use one piece snap closure design. Simply press closed for hanging of signs from wire fixtures or to make light weight sample swatches. Sold in packages of 100.